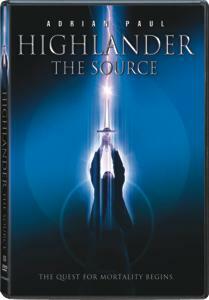 Just when you think that this is a franchise that can't sink any lower, along comes Highlander 5: The Source. All of which says something, this is after all a franchise which has sunk to some pretty low depths throughout the years (Highlander 2 anyone?) . . .
No Christopher Lambert this time round. Instead we get TV's Highlander, Adrian Paul. Paul is a likeable actor who exudes a lazy charm, but none of it is on display here. Here he just sort of disappears in-between the folds of the thick overcoat he is made to wear, the overcrowded cast and the endless sword fights. And the plot which makes absolutely no sense at all . . . something to do with the planets being in alignment and having to find The Source, some kind of energy whatever which will allow Paul's character to become mortal and have children. Or something like that. (The so-called Immortals in this series have always been a misnomer as they can be killed by lobbing their heads off.) Point is, Lawnmower Man director Brett Leonard seems more interested in fancy camera tricks and lighting than making sense of the plot. Two things made me chuckle aloud though: one character called Cardinal Giovanni's silly haircut - probably the worst one since Samuel L. Jackson's dye job for Jumper. And the shots of the Earth's planets being in alignment. Not only are they in alignment but seemed to have moved so close to the Earth that they appear larger than the moon! Strangely enough no tidal waves or anything of the sort ensues . 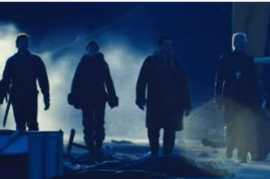 . .
One gets the impression that Highlander 5 was filmed with theatrical distribution in mind but that no sane cinema distributor would touch it with a ten-foot barge pole. Good for them. Instead it went straight to the SciFi Channel (who has no qualms when it comes to this sort of thing) and now the DVD shelves where you should let it stay, collecting dust.